Oh, cool, another book that takes place over 800 years ago. I kid, mostly, but have you realized that virtually NONE of these books take place in the present day? I counted FOUR in the project so far that could conceivably take place in the present day. Two of those are a stretch, and one of them is this year’s Flora & Ulysses, which I read but have not written about yet. The One and Only Ivan basically takes place in the present day, but is based on a real story from 1962. The Graveyard Book is not set in a specific time, but is so far into fantasy as to barely count as present-day. So we’re left with just The Higher Power of Lucky, which kind of feels like it takes place in the past because it takes place in a town so small, time basically doesn’t matter to it. MY KINGDOM FOR SOME CONTEMPORARY REALISTIC (or semi-realistic) FICTION. BUT! 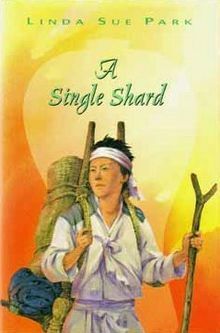 To the task at hand: A Single Shard is the story of an orphan named Tree-Ear who lives under a bridge with his differently-abled friend Crane-Man, where they try to scrape by an existence. He lives in Ch’ulp’o, a village in Korea famous for its beautiful celadon pottery. You know, that pottery all the kids are into these days! Tree-Ear deeply admires the potters, especially one named Min, who is clearly superior to all other potters. He manages to talk Min into allowing him to be his helper, and over the course of the book learns a lot about craft and discipline and all that good stuff. All-in-all, it’s an interesting, well-paced, thoughtful little book! Linda Sue Park is careful with her characters, and she crafts solid motivations for all of them. We don’t really know anything about Tree-Ear’s lost family, but we see its reflection in Tree-Ear’s longing to belong to Min’s family. Min’s bristly personality has a back story as well, as does Min’s caring wife. Crane-Man is a little sketchier, and I never quite figured him out. That’s a shame, because he was potentially an interesting one. I wonder if some of him ended up in the “cut scenes” folder. The Newbery seems to have a penchant for unique settings. A potting village in Korea in the 12th century is not something I expected I would ever read about. The description of the pottery-making process was interesting, especially the bits about the celadon glaze and the discovery of how to create inlays with different types of clay. But, it didn’t pique my interest quite enough to research anything further. I did look up the 1,000 Crane Vase the book references, and it is indeed impressive. Look! The book is a good balance of character development and plot. Park ramps-up the action when Tree-Ear has to go on his mission to the capitol to deliver Min’s completed vase, but this trip doesn’t take up too much of the book. The title itself gives away what happens on the trip, so while it’s a bit scary, it’s not exactly suspenseful. That didn’t bother me, though. You knew something had to happen on a weeks-long journey on foot, so having a vague idea of what that problem would be beforehand really didn’t take much away from it. It maybe softened the blow when it happened. I’m not sure if that’s really a good thing or not. This wasn’t one of my favorite books I’ve ever read, or even one of my new Newbery favorites, but it was solid. Would kids like it? Great for representing other cultures in kid lit. (We need diverse books!) Not exactly the first thing a kid is going to grab off the shelf, but there’s enough adventure and good writing to hook a few kids. Are there “funny bits”? Crane-Man makes some attempts at humor, but the book is overall pretty darn serious. Do I understand why it won? It’s well-written, representative of an less-often-represented culture and time period, and contains valuable lessons about hard work and family. So, totally!